If you have used as a basis the pattern of a blouse with all-round sleeves, then it should be slightly extended. Always check the width of the product along the thigh line. It should be equal to about a quarter of the girth and add to the resulting value of 1 centimeter on the freedom of clinging. In addition, you should check the length of the sleeves. Decide on the length of the cuff. Postpone the line of the bottom of the sleeve 13-17 centimeters and cut off excess fabric. On paper, design a double cuff. on the side cuts, the lower and upper sections of the sleeves are 1.5-2 centimeters. on the shoulder sections of 1.5 - 2 centimeters. cut the hem of the sleeves 1 centimeter. on the bottom of the product is 3-4 centimeters. on lateral sections of a cuff 0,7-1 centimeter. by cutting off the cuff to the sleeve 1-1.5 centimeters. From the remains of the canvas, cut out the fringing stripon the oblique. Its length is equal to the length of the neck, and add to the resulting value of 2 centimeters and a width of 3.5 centimeters. How to sew a bat dress with your own hands? First, sweep the side seams of the future dress, as well as the lower sections of the sleeves. Then they need to be stitched so that the machine line does not break. Thread after sweeping away, and cut the slices. 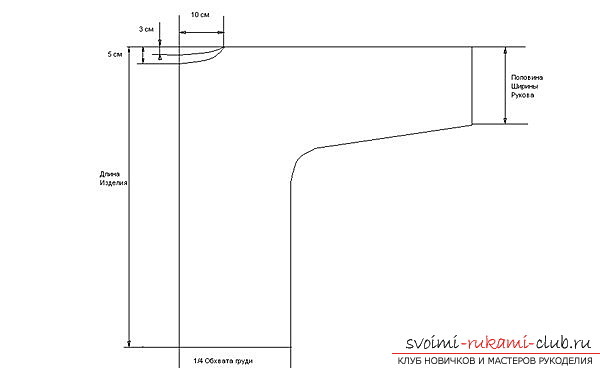 Side seams, iron from the bottom edge to 10-15 centimeters above the waist line. Do the same with the sleeves, retreating at the same time 20-25 centimeters from the bottom. Repeat the same steps with the shoulder seams of the future dress and the upper seams of the sleeves. Fill the neck of the neck with a seam with a closed cut. Strip it is better to slightly pull. The ends of the cuff are stacked in a circle. The width of the seam will be about 0.7-1 centimeters. Carefully press it open, fold the cuff in half inward with the wrong side. Cut the slices, and sweep the cuffs over the fold. Iron the parts. The next step is to adjust the sewing machine. It is necessary to adjust it so that the upper thread is firmly fastened and not looped. It is required to set the maximum stitch length. Carry out 2 machine lines on the bottom of the sleeve. The first should be at a distance of 1.3 centimeters from the slices, and the second - 0.2 - 0.3 centimeters. Place the fasteners first, but do not need to do this at the end. Make assemblies at the bottom of the sleeve. How to do it? It will be necessary to tighten the ends of the threads simultaneously with 2 machine lines, and then distribute them evenly. Then tighten the bottom until the length of the assembled element and the cuff section are the same. Now you will need pins. With their help you will pin the cuffs to the assembled bottom of the sleeve, while you need to combine the seams. Sweep them, and gradually remove the pins. The cuff should be stitched, the width of the seam should be about 1-1.5 centimeters, while plotting a line between 2 to create new assemblies. Thread the lines and lines for the formation of the assemblies removed. All the sections are swept together, and then press them in the direction of the sleeve. Now we have to sweep the bottom section of the future. To make the work more accurate, it is necessary to sew the cut manually, using small hidden stitches. Remove the threads of threading, and then iron the bottom of the product from the wrong side. To date, there are many kinds of bat dresses. Each woman can choose a suitable model for her. Everything depends on the lady's personal taste, as well as on the features of her figure. Note that the bat-sleeve outfit will visually make you lower. In a simple life to wear such a dress, for example, with ballets or sandals without a heel can exceptionally tall and slender girls. A few ready-made dresses for the bat Elegant dresses with air top and eleganta skirt for the silhouette is perfect for a cocktail party, a date or a business meeting. The main thing is that the outfit should be sewn from festive material. 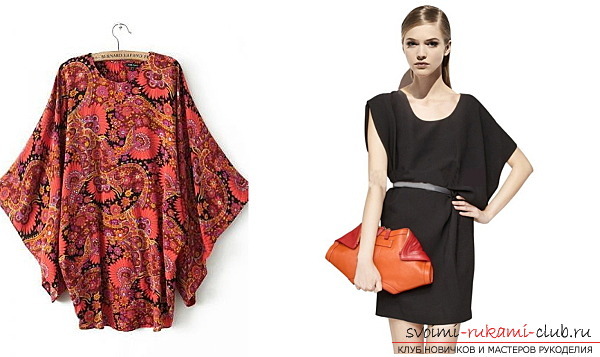 Use the same style, but from ordinary fabric, and the dress can be worn in everyday life. Evening clothes can be made with a deep neckline on the back. The presented style elegantly looks in such fabrics: silk, chiffon and many others. The outfit, sewn from monophonic viscose, is very practical and comfortable. He is airy and does not crumple, nor does he fetter traffic and will suit all cases. If the dress turned out short, then it can be dressed with leggings or narrow trousers. 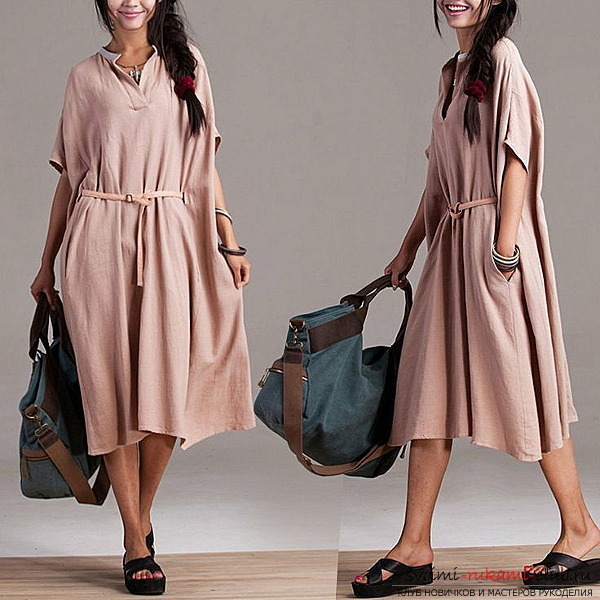 Then the outfit automatically transforms into a tunic. Elegant and exquisite look snow-white wedding dresses made in this style. The girl needs only to collect hair in a high hairstyle, and the outfit will advantageously accentuate the shoulders and neck. The bat dress is comfortable and beautiful at the same time. It ideally conceals flaws in the figure, emphasizes virtues and does not hamper the body movements. Postcard is an envelope made by own hands. Photos and tips for their implementation.